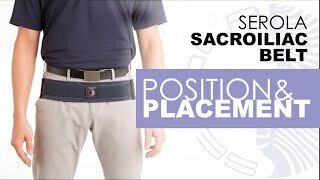 Serola Sacroiliac Belt | SI Belt | Serola Biomechanics, Inc. The Serola Sacroiliac Belt. A SI Belt from Serola Biomechanics. I am a physical therapist and also someone who suffers from SI issues. This belt has been a life savor for guarding my back when lifting or performing tasks that have potential to mess with my SI joint, and it has also helped me when I have acute episodes. Putting it on instantly gives me relief, holding this area still and stable, particularly when I cinch up the sides. I love that the belt is simple and not cumbersome, and I can wear it under or over my clothes with ease. My last belt, I loaned to my mother's friend when visiting; she was having an acute episode. She got such relief, that I let her keep it and ordered myself a new one when I returned home. Finally, I can stop using homemade devices! Thanks! I just knew if I could design my own hip support it would help so much. THIS is the one I would have designed. My hip has hurt for almost 3 years now and this belt finally comfortably delivers the firm, tight adjustable support my body knew it needed. I had been wearing back support belts pulled down to my hips all day, every day, for a year or more, but they were a bit too wide, so they also cut off my stomach and intestines which made me miserable all day, yet, I needed that support. I had even worn a 'fanny pack' pulled tight down at my hips for a month or two. Belts from my closet just didn't work either, no matter how wide. I am so relieved to find the tight hip support I need. Now, maybe my muscle/hip/groin problem will have the 'lift and support' it needs to start healing itself. After 3 weeks wearing this belt my muscles deep in my my hip are starting to relax a bit since they are no longer totally stressed and tied in a knot anymore by day's end. Plus, now I can eat without having to loosen the belt, and can even drive long distances in the car without having to pull off or even adjust the belt. My only complaint is if I wear it swimming it takes a long time to dry out. So maybe I could use two! Thanks. The belt I ordered is a little on the big size, but now that I know insurance will cover the cost of it, I'll order another one. I just have a wee bit of a problem getting it to stay in place....it wants to slip down on me, especially when I have to go pee, but I can deal with that because it has already given me so much support when it's in the right place that I would give it 10 stars if that was an option. LOVE IT!!!! I have used Serola belts for years. They only get better and better, just as I get better at recognizing which patients need them & which don’t. There is no better belt on the market. I use one when my SI joint gives me problems, periodically. If you’re on the fence about trying the Serola belt, I highly recommend going for it. I had a previous work injury that caused lower pain in my back from a really bad sprain; a lot of my job requires me to shift boxes weighing 25-50lbs around. This belt helped with my lower back pain, my hip alignment, and it also gave me peace of mind. Not only is the product great, but the staff is as well. Customer service representative Dayna went above and beyond when I had my belt overnighted and made a bunch of mistakes. She kindly dealt with my panic, and also took care of some complications with FedEx I was having. Having a great product with a great company that backs it speaks volumes, and solidifies Serola's place within the medical community. As a bodyworker, I keep one of these belts in my cabinet for times when I think it might be useful for a client. I'll have them try it on in the office and if they notice an immediate benefit (it usually is dramatic), then I direct them to buy their own via Serola's website. If they don't notice a remarkable or immediate benefit, it's likely not going to help their issue much. A chiropractor told me about this belt years ago. Both she and some of my post-pregnancy clients have said what a big difference this made in the weeks post partum. Not a gimmicky product, really helps for the right people! Did well after back surgery, but while taking care of my father, he started to fall..... so natural instinct was to save him. My hardware stayed intact but had “tweaked “ my muscles. Saw a physiatrist at recommendation of my back surgeon. She recommended your belt. It has helped to stabilize my SI joint while I was able to strengthen my core muscles. I highly recommend your belt, easy to put on and stays in place. Will probably order a second one! I have been suffering with low back pain and SI joint pain for years. My physical therapist recommended the Serola belt and I love it. I am on my feet as a nurse for 12 hr shifts and I can't believe what a difference wearing the belt made! I feel so stable with improvement in my pain and posture. Thank you!! The only thing better than this belt is the information on the website. I injured my SI joint ligaments when I was 12 and didn't figure that out until I was 32. Unlike many my patterns did not include extreme pain as the injury must be minor, but the side effects of the muscle slings stabilizing my joint have led to me quitting virtually all physical activity, sports and even playing music. Wearing the belt helps with everything. I am undergoing prolotherapy with hopes of restabilizing my joint and until the therapy is over, I'm going to be wearing this belt continuously. I recently bought my 2nd Serola SI belt. (The first one lasted over 4 years.) I have chronic SI joint instability which had caused me years of lower back pain. After multiple unsuccessful treatment methods, I bought this belt. Almost immediately my pain subsided by about 90%. After consistently wearing the belt (under my pants) for a few months, the pain went away completely. I have been wearing the belt ever since. This was probably the single best purchase I have ever made. The Serola SI belt has dramatically changed my life. Not only is it helping my SI joint issues, but also seems to relive pain from my degenerative disc disease and arthritis in L4 and L5. I experience so much less pain now and have tremendously more freedom of movement. Makes me feel years younger. I had also purchased the belt extender thinking I was in between sizes and didn't need it. Their customer service for the return was as impressive as the belt itself. I will certainty be a lifelong advocate of this product and company. I really do think the Serola SI Belt is terrific for low back pain. It has helped me innumerable times thru a number of challenges, including long flights and hiking up the Himalayan foothills to the world's most beautifully situated and reverent monastery, Tiger's Nest, in Bhutan. I wear it for household chores, too. It works whether I wear wear it over my clothing or under. I do however, find in intrusive to wear over my clothing as it tends to get in the way of access to my pockets. It is also a bit inconvenient to take on and off when I visit the toilet. If I wear it under my clothing, it needs frequent washing (IMO). The two last adjustment flaps tend to stick to the belt and must be detangled a bit, which easily frustrates me a bit. I did wash it by hand several of times and that worked okay. I would not trust it to the washing machine. Great product. Much preferred over all else on the market. I am a pelvic health PT with a specialty in obstetrics and postpartum period. My clients LOVE this belt. Especially for SIJ dysfunction, symphysis pubis dysfunction, pelvic organ prolapse or general lumbosacral pain/instability. It is so easy to get on and off and fit is fairly customizable. Awesome product, hands down. Been suffering from pelvic rotations/misalignment along with SI pain, which initially surfaced due to a L5 bulge. Non of my PTs recommended this; however, with extensive research and reading through others' success stories related to the belt it seemed like a good fit for my pain symptoms. From unsuccessful epidural shots, months with a chiropractor, 1/2 year with multiple PTs, to this and I am finally showing more relief. This belt does wonders, however, I only wear it under conditions of increased pain (Sitting for longer periods of time or when I know there is going to be lots of standing)... Don't get me wrong, Physical Therapy is helping from an overall pain management standpoint (correcting alignment & strengthening muscles), but this has definitely lessened the overall pain and made it that much more manageable. Absolutely great belt! All my patients are so happy with it. We have a lot of patients with really difficult jobs in the towns and cities around our busy clinic ranging from farming agricultural to industrial warehouse work and every patient is just so happy to have their life back without worry. Thanks Serola!! Wonderful belt...just buy down a size than what is recommended. My PT recommended this belt for me as I have hyper mobility joints. It is outstanding in how well it helps. I wore for a 7 hour car ride and did not experience my usual pain and discomfort. I do think the measurements are not accurate though. As I measured my hips at 41 I purchased the large...it is too big. I suggest customers drop a size smaller from what is recommended. I had severe pain in sacroiliac joint. A combination of physical therapy exercises and the Serola belt really helped. I'm an avid golfer and wear the belt every time I play. It's been great. Glad I bought it. For years I have dealt with lower back pain and hip, but no one to find out what was wrong. My x-ray and MRI showed nothing, so I lived it. I recently moved and was having really bad pain again and my new doctor review me to a chiropractor. I don't really like chiropractors but I was willing to listen. She told me that over the years of just daily life my pelvis got twist and I need to learn how to walk, sit, bend and stand again the correct way. It all made since to me and she recommend me trying Sacroilia belt, which is amazing. It keeps my pelvis stable and aligned it has reduce the back and hip pain. I am now doing rehab we learning everything again the right way, but the relief I felt after putting the belt on for the first time was a great feeling. I have tried other SI belts and the Serola is the most comfortable and works best for me. The Serola belt is a Godsend for me. I have a damaged (torn) SI joint on my right side, but because I also have severe osteoarthritis (and other issues) surgery is not an option. Without an SI belt I can walk only a very short distance before it becomes too painful. With it, I have almost normal ability to walk. This is my fourth Serola belt. I have two belts and wear one during the day and the other at night. When my day belt starts to show wear, it becomes my night belt and my night belt gets retired. Without this belt, I would be walking with a walker or would be in a wheel chair. I purchased this belt to help with my sacroiliac joint dysfunction. It has helped me so much. I have a hypermobility si joint. I am able to get around normally now. I am glad this product was available to me. Thank you Dr. Serola. I really like the Serola support. It gives the sacroiliac joints the support they need without hindering lumbar range of motion and function. I forget that I even have it on. Very good product that I will be recommending to patients in my chiropractic practice. This belt makes me a better nurse!! I am a nun working 80 hours a week in health care on terrazzo flooring, which is basically concrete...!! My younger sister who is a Rolfer in Boulder worked on my glutes/hips one day and found in one session what my PT didn't in months...that my SI joint has very little stability and my hips are double jointed and slip out of place a lot, added to the fact that my entire body has loosey-goosey ligaments, I was having lots of sciatica, stressed hamstrings, hip and lower back injuries, etc ALL related to this!!! When I finally put on a cheap SI belt, it was too stretchy and didn't provide me with the support i needed. Then the Mars Wellness SI belt (the 2nd one i tried), the band was WAY too wide and i couldn't sit down without it slipping upwards (definitely NOT made for a woman's curvy body!) The Serola belt has been a game-changer...My posture DRAMATICALLY improved (i didn't realize how much i was leaning forward to compensate for my pelvis which i naturally tip backwards) the pain in my glute, hips, legs, and even my feet, ALL is manageable now even without having to go back to the PT!!! Also, i was maxing out on ibuprofen and tylenol DAILY, so now i only have to take maybe 1 dose a day!!!! Your Sac belt has been wonderful. I wear it when I golf, and have been pain free while using it. I referred your site and product to my physical therapist for his patients who are struggling with sciatic pain. Money well spent, as it really does seem to be helping with back, hip and psoas issues; used as needed. Thank you! This belt was recommended by my physical therapist and it was an absolute game changer! I am a cyclist and was able to get back to racing with almost no discomfort in my hips and lower back which have been a perpetual issue. I use this during all physical activity and has gotten me back up and active much quicker than I originally thought. At least now I don't have to lie down in the middle of the day. This SI belt helps provide enough support to enable me to work all day without having to lie down at lunch time. Unfortunately, it also throws my proprioception off somewhat (as evidenced by a little poorer balance when wearing the belt). Despite this, I use it most of the time while awake. I am a physical therapist and second pregnancy. While I suggest belts for pregnant patients it wasn't until this pregnancy I found myself needing one desperately! It has been wonderful for exercising, working and keeping stability for both pubic symphysis discomfort and lower back/sacral discomfort. Now I know first hand the value of this very low profile easy to use Serola belt!! A purchase that will continue to help my back after many years of discomfrt. When I first tried on the belt I had no problem positioning it properly- but could not get it tight enough. After reviewing the above video I searched for the elastic strips and found them and can now have it fit snugly and it give me the proper support. Now that I know how to adjust the belt I am sure it will be as much of a success as your other reviewer's remarks. This belt is a game changer! During the delivery with my first son my pubic symphysis completely tore, I was on a walker for three weeks. Luckily my body healed but it started to flare up again during my second pregnancy. My physical therapist recommended this belt and it has made all the difference in the world! My pelvis feels stable with little to no pain and my back and hip pain have subsided tremendously. I recommend this to all pregnant women who are experiencing any pain! Thank you for the belt. I ordered a "custom size" the fit is great. this was not an issue when ordering, very pleased with that; really helps the si joint and I am able to walk a lot better - even when grocery shopping!! Purchased this belt on the advice of my PT. It's comfortable, easy to wear and works well to provide stability and reduce hip pain. Would definitely recommend! An SI belt that Works! I love my SI belt! I have been wearing it for several weeks and the pain in my back is greatly reduced. Thank you for a superior product--it does what you say it does and I am very grateful. I LOVE this belt. I have been pain-free since I put it on two weeks ago. My only suggestion would be to have it available in different colors, especially beige or khaki, to be less obvious on summer colors. My PT told me to get this belt, and it has been a huge asset. I am recovering from reconstructive hip surgery, and my altered gait has brought on some lumbar and SIJ weakening. I felt like a human "Jenga" game until I got this belt. It took me a few days to figure out how to put it on and when it was helpful/not helpful, but it definitely helps in the feeling of my core feeling more together, which was my PT's goal in recommending this belt. I've been wearing the belt for three weeks now, and still working on the side adjustments, but I wear it when I am walking around/active and then it is my golden ticket to a good night's sleep (I sleep on my side, so I don't feel pain with the belt on as it keeps everything together. It does take a little while to get used to it, and I often wake up around 6am, use the restroom, and go back to sleep without it on. It's been a life saver for sleep! This is most definitely worth every single penny, and I am hopeful that I can now work on strengthening my core, as my PT says is crucial to my rehabilitation. I purchased the Serola Belt a few years back with great results. I recently experienced lower back discomfort and hip pain so bad it hurt to get out of the car. I pulled my belt out and with in a few days I can happily report that the pain is 95% gone. My husband has been suffering for the last 10 wks with the same issues but with more intensity. He's been in PT 2x per weeks and still having issues. I purchased him a belt and just waiting for it to arrive. I am hopeful that this will be his answer and will report back on his progress. I am a petite woman who works as a physical therapist with a very strenuous population (a lot of heavy lifting). I was seeing another PT who recommended the Serola belt which I now wear every day. It helps prevent some of my pain and though it gets uncomfortable by the end of the day, I no longer get sharp, shooting pains I did prior to using it. I've also tried other SI belts that were thicker and did not fit my small frame very well. Definitely recommend the Serola! This belt gives a lot of support for the sacroiliac joint. I have had many patients get positive results with this belt. Great Belt, buy it, no wrong! Now I am wearing this belt, and I feel very comfortable. Good belt for controlling my sacroiliac. It worth Five Star! My Doctor suggested I buy this for my SI pain. It wasn't very expensive so I figured I had nothing to lose. To my surprise and delight, it alleviates the pain very well and is comfortable to wear all day, doing anything from driving to household chores. It keeps your posture in the correct position that takes stress off of the SI joint area. Very pleased. My wife, who was injured in early august, was allowed to "try out" her physical therapist's belt. She found it very helpful, so we ordered one. We wanted it quickly so paid extra for the speedy shipping. Well, the shipping didn't work out so well. Being close to Christmas, the Fedex driver (probably a temp) seemed incapable of delivering the belt to us. we finally called Serola and I can't say enough good stuff about their customer service. They "lit a fire" under the shipper's bottom and the belt, due to their intervention, got to us. They refunded the extra paid for speedy shipping since it did not arrive in a timely manner and were quite helpful throughout. As to he belt - my wife uses it regularly and it seems to be helping. So - in closing I'd recommend the belt if you need support in that portion of your back AND I'd highly recommend you buy it from Serola directly. Try this belt, worth every penny!! I found the Serola SI belt while enduring another round of hip and lower back pain. I've carried mail for over 23 years and spend a lot of my day walking with a heavy bag twisting my body in an awkward position. This belt ROCKS!! Wish I had known about this year's ago. I wear it every day at work and at home when I do anything that involves bending and lifting. Try this you won't be sorry! Seemed to work initially but not after a few days. Initially, I thought it really worked to reduce pain from my SI. But there is a lot of variability in my case, both in intensity of pain over time as well as location. In view of this variability, I am not so sure I can say it actually worked. Best product I've found for my long suffering SI-Joint. I am a retired Air Force veteran having punished my back for 22 years. And aggrevating it to the point of pain shots with an injury in Iraq before retiring. I have shared your pamphlet and youtube video with 3 co-workers and two went home and purchased the Seralo Belt this week. I would like to get your arm band for my tennis elbow as I struggle to lift even light weight objects. Thank you so much for this amazing product, the relief was immediate and best of all, natural, no meds. I am so grateful for this product. Sitting at my desk at work or riding in a car for more than a few minutes was tortuous. As soon as I started wearing it, I got relief. It can be worn over or under clothing and is adjustable and forgiving in terms of size. I also wear it at night and it has enabled me to sleep without pain again. I cannot recommend this more highly. tried other "sacroiliac belts"- some cheaper and some more expensive, but Serola is the best by far. There is no comparison. I am a chiropractor who was introduced to this product by another chiropractor. I initially prescribed it to my patients, who always report how amazing it works. My patients who get back pain with prolonged sitting are extremely happy. When they have long flights or drives, they just put it on underneath their clothing and they make it to their destination pain free. I always tell them, that if they hurt themselves to put the belt on immediately and wear it until they can get an appointment with me. I became a true fan of this product, when I hurt my low back and used it. My occupation is physical and it help me get through my works days. 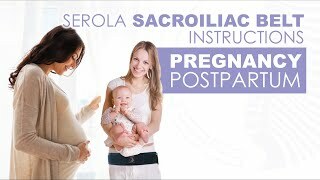 I tried other "sacroiliac belts"- some cheaper and some more expensive, but Serola is the best by far. There is no comparison. I had piriformis syndrome after a short vacation from too much walking. A back belt was recommended and an Internet search led me to the serola belt. That plus lots of stretching resolved my problem. Since then I wear my belt whenever I plan on walking or working on my feet. The doctors are still unsure of what is going on in my lower back, but the only thing which relieves pain and allows me to walk is an SI belt. My physical therapist originally gave me a cheaper belt, but it had a plastic buckle which dug into my stomach. This one not only does everything an SI belt is supposed to do, it is comfortable to wear. I can attest to the comfort because, as of right now, I have been wearing a Seroma belt daily for almost a year. The belt I just purchased is to replace another Seroma belt which is starting to show wear after so many months. I will continue to use the older one for night and the newer one for outside the house. I run a small PT practice and I almost exclusively use Serola belts. They offer the most reliable and adaptable form of compression/stability for the SI joint and are well constructed and last. In addition, my experiences with orders and shipment have all been very smooth. Overall Highly recommended. I have used this belt since 2011, and this is the second one I bought. Have recommended it to others including my surgeon and chiropractor. Unlike other SI supports, this one is light weight and easy to use; it acts as a ligament without inhibiting muscle strengthening and use around the SI joints and pelvis. This is my 2nd purchase of this belt. My first one is just looking really worn out, but I will still use it but only for outside work. It definitely alleviates my right hip pain caused by an inflamed nerve. I alternate the belt, at times, with an OTC stick on heat patch. The heat patch will work for a day or night for me as I cannot wear the belt 24 hours a day. I would not be able to control my pain without this belt, however, and recommend it without reservation. works great actually....lighting fast delivery. good seller! serola belt makes long walks and hours of standing feel normal again. it increases my stamina on walks while not feeling any pain and fatigue most of my shifts. at home i use it while working on home improvements. I'll give it five stars now even though I haven't had much pain to test it against. At the end of my last pregnancy, my SI joint was out of whack and I could barely walk as my ligaments loosened up for giving birth starting around the 33 weeks. My chiropractor told me to get this and even though I'm only 24 weeks along, my sacrum has already started shifting and I've had a bit of pain. I've been wearing it as needed or when I think about it. I wear it walking long distances or on the treadmill. It's not hard to wear and I believe it does help control pain. It's comfortable and easy to put on. My husband said my posture looks straighter when I wear it. Sometimes it is annoying as it presses in on my bladder and I already feel like I need to go often. I'm hoping this will save me from serious pain as I progress in my pregnancy. Maybe I'll update this in a few months. My PT didn't recommend any particular SI belt, but after I searched around on the web for 30-40 mins it seemed like the Serola Belt was best. Received it directly from Serola in about 5-6 days. I think it works well and is quality-made. It does, in fact, seem to keep my SI aligned, so definitely worthwhile. My only suggestion (and it's just a nit-pick), is that the tabs on the velcro actually be velcro-less tabs so they stick up/out and are easier to grab; as they are now, they are simply a part of the velcro that extends beyond the nylon belt, so they are flat against the other part of velcro... if they were not velcro (but rather stitched-on nylon or something similar), the would be easier to grab when un-doing and loosening the belt just prior to taking it off. *Really* not a biggie, but in my opinion would make it "perfect". I was surprised when a physical therapist friend told me about such belts, and after a couple more weeks of pain, I ordered this one. Yup, I diagnosed myself (with her help), and the fact that the belt helps so much seems to prove that my pain was SI pain. I wear it all day every day. It tends to bend over itself because of its placement on my overlarge tummy, so if it were a tiny bit wider, maybe that would be nice. But it's unobtrusive, relieves most of my discomfort, and I'd recommend the same belt to just about anyone with my symptoms. The price is good, too. This belt has helped tremendously and my pain levels have gotten better. I'm able to wear under my clothes when we walk and ride our bikes. I'd recommend it to anyone. I received my belt promptly. It provides great support. It is slim & easy to wear undetected under tops that are not tucked in. I have used the Serola belt for over 10 years. I have torn SI joints from a car accident and have had injections, rizotomy and physical therapy. All work as a temporary fix but eventually I am in pain again. When I use the Serola belt, I get the support I need to keep my SI stable and it reduces the pain significantly. I would and have recommended the Serola bet to others. The other "copycat" products are NOT the same. "Back" on track. After it arrived 1 day late. Belt gave quick relief to my wife's lower back. The missing "star" is due to shipping and customer support. They promise to ship on the day of order if it is received by 4pm, and my order was placed at 2am. But shipping missed the deadline, and it took a day longer than advertised (5 days instead of 2-4). 5-star customer support would have noticed their shipping delay and upgraded the shipping. I would suggest following up an online order with a phone call to confirm their shipping commitment. My physical therapist recommended this belt, and I've been wearing it for over four years for chronic SI dysfunction. It reduces discomfort, and I wear it all the time. The only time I don't wear it is in bed and in the shower. It is a relatively inexpensive way to help the problem. The only negative is that the belt can get sweaty, especially with exercise, in the summer months. Also, if I wash it at bedtime, it isn't quite dry in the morning. I bought a second belt a few years ago and recently added a third to the rotation. It is well worth the small extra cost to have the extra belts when I need a dry one. I have worn the Serola belt for only two weeks , but I can't stop raving about it! 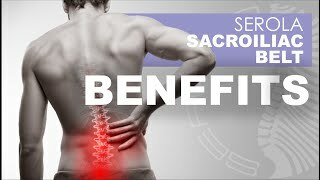 I have had a desk job for many years, and sitting for such long periods of time a day has weakened the sacroiliac joint, causing a lot of low back pain. Wearing the belt has just about eliminated the back pain, and I feel it is making the joint more stable. With continued use of the belt and continued physical therapy, I am looking forward to even more improvement. I do not hesitate to recommend the belt to anyone with a similar condition. Go ahead and buy this belt! I'm expecting twins and ordered this belt by recommendation of a PT friend. SO worth it! The belt offers immediate support and relief. I have several maternity belts, but none compare to the support this offers. And the low profile means that my bladder isn't compressed if I wear it while sitting (MAJOR issue with other maternity belts). I will continue to wear it as I grow, and probably postpartum as well. Worth every cent! I am amazed at how much this belt helps. I have bee suffering with bad hips & sciatica for years. At my age I just felt some pain was always going to be there and I learned to live with it. I've only had it for 1 month and I am thrilled with the results. OMG when I tell you this belt saved my life, I really mean it! I was in pain for an entire month before I purchased this belt. I was getting acupuncture treatments and doing yoga poses to combat some of the pain but I needed a little more to stabilize me while sitting and walking, so I came across this ad about this belt that my co-worker sent me a while back . What did I have to lose so I ordered it and lo and behold I'm feeling so much better along with the other things I've been doing to combat the sciatica nerve pain. I have had other SI belts but this one is more sturdy than the others, yet still quite comfortable. It is very supportive. Was highly recommended by my PT and I am very pleased with the product. I don't know yet how well it will hold up long term. I've suffered from herniated disks for nearly 8 years. Nothing has helped keep my hips so stable and in alignment as the SI belt. I feel stronger when wearing this, and even when I take it off I feel as it is making me stronger. It's a great product. Even though I've been released from physical therapy, I still wear it whenever I perform an activity that might strain my SI joint. It stays in place and is easy to adjust. I've worn it both over and under clothing. Highly recommend it. I'm undergoing PT and this belt definitely helps to stabilize the SI Joint, so I can do my exercises more effectively and without pain. I wear it under my clothes and it is not uncomfortable. You really don't need it to be very tight, just positioned in the right location. This belt gives support that is felt immediately. I really like the extra stability the stretchy 'wings' provide. I also really like that it is so flexible while giving such support. This has been a tremendous help keeping my SI joints in place and eliminating my back spasms. I cannot tell you grateful I am that I bought the Serola SI Belt! I have gone through years of very low back pain. It had gotten to the point where it was hard to stand, sit, sleep, live normally. I went to a doctor and she told me that she really thought it wasn't so much my sciatic but my SI joints. I searched for something to illeviate the pain and came across this. I wore it for only 2 days and felt so much improvement. I can move without fearing pain, I can sit and I actually got two good night's of sleep. I am so impressed! Thank you Serola Biomechanics!!! As a physical therapist, I knew that using an SI belt would provide great stability and support. Now, as a patient, I can definitely say that this is true and not just theory! I had an SI injury early in my pregnancy and the pain became almost unbearable. When I put this belt on, I had immediate relief. I did receive physical therapy too and now I don't need the belt on all the time. For me, the belt is really and supportive when standing but a little uncomfortable when sitting for extended periods or car rides. I plan to wear it with exercising to provide extra stability too. I believe the Serola belt in particular may be the best in the market and was truly a Godsend for me. I had a lot of problems standing before I got this belt. My therapist told me to get an SI belt and I found this one. It's magical. I'm 5 months pregnant and now pain free. So lucky to have an amazing therapist and this amazing belt. It's pretty comfy. Only downside is that it's a little hard to bend over / squat in and can be a challenge to pee with. It's work to put on and off the belt, but worth the minor inconvenience. I had intense SI joint pain during my pregnancy, but didn't get this belt until about two months after having my baby. I wish I had worn it my entire pregnancy. It has been extremely helpful with pain reduction and muscle stabilization. Highly recommend it for any pregnant women experiencing SI joint pain. I am a retired PT, and have worn this belt for years, as I have chronic SI instability. I learned about it at a conference 12 years ago.This belt was a replacement for my old one. I have worn other belts over the years, but this one is far superior as far as comfort and the ability to fit under clothing unobtrusively. It is also well made and does not wear out! Love it! I have been recommending these belts to my patients for years for the excellent support it gives the lumbosacral spine. Although the belt does not correct SI joint misalignment, it gives stability, strength and prevents future soft tissue damage. The new material is better than the original; at first I was hesitant. The new material stays in place under clothes as the belt is less bulky and stays put on skin without discomfort. I wear one to work and whenever I work at home. Best investment I have made for my SI joint. I broke my tail bone 30 years ago and the pain in that area has increased every year. Two years ago it got worse and I tried the chiropatric route, massage therapy, etc. I was avoiding any surgery. At a meeting I commented on a friend's bout with back pain...she responded, "i was told I could not have anymore surgery on my back and my doctor told me to try this belt. I have little pain now." I ordered one the next day and my pain went from a 9 to a 2 immediately. I am so grateful. The Serola belt has truly been a godsend. It has done more to help dissipate my post-op attack of sciatica than any intervention by PTs (who recommended the belt and let me try out a loaner! ), chiropractors, and osteopaths. I have been wearing it every day for the past two weeks and I am definitely on the road to what I hope will be a full recovery. It's very comfortable, though your current size Small belt seems slightly longer than your previous "1", so it does gather up on me more than the loaner did. Nonetheless, super comfortable and very helpful. I wear the hip stablizer when I am doing a massage. I find it helps to keep my hips and shoulders in alignment. I also have my son who is a massage therapist wearing one and my husband who travels for business. Both scoffed at the idea that a belt so small in size would be any good and both were pleasantly surprised by the results. No low back pain after working massage for 8 hours and my husband was able to get off the plane without limping. I have also purchased some of these belts for my clients. It is especially helpful for people with a forward pelvic tilt. Some of my clients have one hip higher than the other either naturally or as a result of trauma. This belt helps to keep the hips in place after some massage and adjustments by a chiropractor. My clients tell me they can walk for longer distances and time. I live and work in South Florida and the best thing about this belt is it is comfortable even in warmer temperatures and is non restricting. It also is unnoticeable under clothing made of lighter fabrics. Some of my clients have even decided for themselves that wearing it to bed can also keep the pain of getting out of bed down to a minimum. All in all, I highly recommend this belt to anyone with low back pain for all of the above reasons. Great product, very comfortable and supports my lower back in any circumstance. I do a lot with horses and this belt is perfect for support needed while dealing with or riding as it is thin enough not to get in the way or constrain me when I need to move fast. I also use it while driving and at work sitting much of the time. It has really helped to alleviate my sacroiliac pain. Love this belt and will definitely recommend. Thank You so much!! The belt is great. It is helping to stabilize my SI joints and also my right hip. It fits greats, stays in place and can be very easily adjusted for the right amount of tension. I would definitely tell others to try this belt. Thanks for a great product. I borrowed this belt from my PT to give it a try. I ordered one the very next day because the relief was immediate and measurable. It is great for when you have a flair up or know you will need to be out and about and very active. I have zero regrets buying this belt and think it is worth even more than is charged! When you get relief from that L5/S1 and SI pain it is like an awakening and a flash back to a time before the pain. My only suggestion or note is that if you happen to do a bit of sitting while wearing it, some of the harder edges near the strap ends can dig into you. I think it might have to do with the width of those areas and the female body shape as several reviewers have noted. I've experimented with on-skin, over t-shirt/underwear combos but even some skin irritation is worth the pain relief. Good buy-would tell others to buy as well! Overall, I'm pleased with this purchase. It was delivered promptly and greatly helps alleviate my SI dysfunction pain particularly when I bend and squat. The only complaint I have is that the belt is not as wide as I would like. The measurements from the guide provided were true to size I found. Since a hard fall on my lower back some 45 years ago, I thought I had tried it all to get some relief. I always figured it to be a lumbar issue, but when the hip pain began, my new doctor suspected sacroiliitis. Physical therapy helped, but when I googled sacroiliac support, I noticed the Serola belt. It has become my best friend. It took a couple of days to put it on just right, and it does need to be adjusted at times, but it really seems to hold my core together and allow the muscles to concentrate on their real function. I am very active, and I have been wearing the belt over 2 weeks for a good part of each day. It works, even though I can't believe it. It takes getting used to, but you will soon know if you have it on just right. I am thinking this is the best back treatment I have found in 45 years of looking. Now perhaps I can finally strengthen my core, and find some comfort. Shoveled 30 inch snow with no problems thanks to this belt! I have been suffering from SI joint pain for two years. My chiropractor has helped me tremendously and he recommended this belt. It provides a wonderful feeling of support. You can wear it to bed and it helps with the scutching you have to do to get comfortable, which is usually painful. We received 30 inches of snow this weekend and I shoveled my 60 foot sidewalk wearing the belt. I felt great afterwards...no pain! I recommend this to anyone who is suffering SI joint pain. It truly is thin enough to wear under clothing. I have had my belt for almost 2 years now. This thing has SAVED MY LIFE! I was having severe debilitating muscle spasms (due to an injury I suffered in car accident 13 years ago) and I ended up in 4 months of physical therapy (P90-X fitness program is not for people with hip injuries! No matter what you tell youself). My physical therapist recommended this belt and it was worth every penny. My goal was to strengthen the muscles as much as I could so that I did not have to rely on the belt as much. Now if I feel things getting tight or starting to pull, I throw on my belt and I'm good to go. It does have a tendency to ride up in the back after sitting for a while, but that just helps me with wellness and keeps from sitting at my desk for extended periods of time, so while it's annoying I've managed to find a way to deal with it. Quality of life is really important and when you're in pain all of the time, it's hard to maintain your life in general. Thank you Serola for making a great product and giving me back my life! Recommended by PT. Recent fusion and fixation of L2-L5 created severe pelvis weakness. This belt has eliminated much of the imbalance that was created by this condition. Does the job nicely and worth every penny! My husband had back surgery 2 years ago, but started having some slight pain. Heard about this belt from a friend. My husband is doing much better since wearing the belt. He says it's very comfortable and lives that it is concealed very well. Thank you for making your product so affordable. Will definitely tell others about this! Serola products are pretty much the only products that we keep stocked in the office because they are that good. Anything else may sit on the shelf a while, but these products move fast due to their uncompromising superior support, comfort, and quality of materials used. I once tried another company's SI joint belt, but it was terrible. I definitely learned my lesson. I will never use a different company's product again. I have been using the same products for myself, family, and patients for over 10 years, and the quality and results remain consistently good. Additionally, I have ALWAYS had excellent customer service. I feel like I am treated like gold by this company. This is not something that I say about anyone....only those who truly deserve that sort of recognition! Different from what I'm used to but so far so good. Comfortable to wear all day and very supportive. Great brace! Comfortable yet very supportive! This support brace is amazing! I am 7 months pregnant and was experiencing severe hip and pelvic pain which is refered to as symphysis public dysfunction. At times the pain was excruciating and sharp. I received the belt in the mail and put it on right away. I was really shocked at the amount of support it provided and it was super flexible and adjustable! Within 12 hrs the pain had subsided and my hips didn't feel like they were going to split apart any longer. Was very impressed with this brace and the relief that it provided! I am even happier that I can use it after the pregnancy as well to help support my hips as well! My chiropractor recommended this belt to alleviate pain and provide support for SI join dysfunction in my right hip. Over the past year I've endured 2 painful and expensive SI joint injections and a handful of chiropractic adjustments along with electrical stimulation which all provided temporary relief. This belt has been very effective in helping to reduce my discomfort rather quickly which is truly amazing. My only complaint is having to readjust the belt several times a day which becomes very annoying. The design seems to be more suited for men rather than women with hips. In any case, this belt is helping to reduce my pain at a very reasonable cost. I wish I knew about it a year ago! This belt has changed my life!!!! I am currently pregnant for a second time and the pain I was having in my right hip was awful. Apparently my right SI joint is unstable and the piriformus muscle ends up in spasm trying to stabilize the joint. Any prolonged sitting or standing was unbearable, and bending over sends pain down my leg. Some days are better than others, but the discomfort was always there. After countless visits to chiropractor/massage therapist/physiotherapist, I took my chiropractor's advice and got this belt. Within minutes of putting it on, I had relief. I still feel some discomfort, but sitting, standing and bending over aren't painful anymore. Definitely worth every penny! Comfortable yet provides needed support. Comfortable to wear and provided the necessary support I needed. I was in a very bad riding accident 37 years ago; my lower back was broken in four places and my pelvis was shattered. The chronic pain I have felt since the accident has been relentless. I have seen chiropractor after chiropractor, have had various types of physical therapy and all sorts of massage. The pain has never really gone away. I had come to belief this was my life. Then, last winter, while shoveling snow for far too long, I herniated three discs and a piece of one of those discs lodged itself against my sciatic nerve. The pain was excruciating, worsening every day, to the point where I had to quit work. Several trips to the ER for pain management, two epidurals and a WHOLE LOT of pain meds later, I had surgery. The surgery resolved the sciatic nerve issue but I was still left with my chronic SI pain. My physical therapist recommended this belt, explaining that it would simply help "hold" the SI region together as I went about my day. I ordered the belt and used it as directed. Here is my response: UNBELIEVABLE!!! I have NEVER used a product that works this well!!! I truly feel as though I have the support that my SI region has been longing for all these years. As I wear it and am able to regain strength, there are times when I feel no pain whatsoever! I wear it first thing in the morning while doing my chores and then I take it off to go about the rest of my day. If I have any heavy lifting to do (such as moving hay or lifting the ramp on my horse trailer), I put it on ahead of time. It is AMAZING what this belt does for me. I could not be more in favor of this product. It has become a permanent part of my life. You've GOT to get one!!!!!! In general this product works. My only negative comment is that I must have put it on too tight because I ended up with developing pain in my buttock as if I had injured the area. I then realized that the pain came from the belt application. Now I am more careful of how tight I apply the belt. Otherwise it does work for SI pain. I have had SI problems going all the way back to my second pregnancy which was more than 25 years ago. My SI joint on the left is too lose or too flexible and I can have it slip out easily. When I am doing housework I must wear this belt, or I risk being in pain the next day. Wonderful product, I would highly recommend it. Actually I already have. The pain in my SI joint is greatly decreased. It is truly the only belt I have ever owned that was comfortable and helped me so greatly and I actually forgot I had it on. Can't get much better than that. My pain has decreased tremendously. Many thanks. I also have to give a big shout out to my Physical Therapist, at Siskin in Chattanooga, Tn. Dr. Jill who did not recommend it, she just said "Order it." Glad I did. It's like a hug on my hips! I wear it under my sweats and it's very discrete. I feel less pain and know that the muscles in my hips are getting stronger every day! Would recommend! The belt is something I learned about 21 years ago and have bought thousands for patients. Many report that the belt has changed their life and are very appreciative for it, and for me finding it. The first Serola belt I owned I left somewhere in a restroom. With my new one I have figured out how to wear it without removing it when using a toilet. The support the belt gives me is a relief from pain, both residual and stabbing. I am glad to have been introduced to this invention! Has been working great for my Post-Pregnancy patients to keep there pelvis stable during recovery. I got this belt years ago in physical therapy and put it aside- then I wound up back in PT for SI dysfunction and this belt has saved my back/ hip/ pelvic pain. I work long days- and I have forgotten to wear my belt twice, both days I went out of alignment with in a few hours of standing. I now have a back up belt so that I don't ever forget my belt at not have it at work! Except for some difficulty keeping it in place - i.e. It buckles up on me, this belt helps me get through my work day on my feet with LESS pain. My PT recommended it. I can't travel without it. I can't travel without it. Makes those long flights bearable. I highly recommend this for pregnant women who are experiencing hip and back pain. I didn't get diagnosed until after my 2nd pregnancy with extreme pain in what I thought was my hips. Turns out my pelvis wasn't aligning right. Before the belt I couldn't lift my legs, stand long or sit long, go up stairs or even walk without looking like a penguin. But after wearing the belt I am able to do all of those things again. Only thing I would recommend is that it be made a little wider. I have had six kids and am carrying extra weight around that area and it would be more comfortable if it was wider...lifesaver!! Was skeptical, but now I am enthusiastic believer! The SI Belt was recommended to me by my medical doctor. I was skeptical that anything would help me with SI pain as I have a herniated disc between my L4 and L5 spinal segments. I have had the belt for two weeks and love it so much I want to even sleep with it on. My back pain has gone down considerably. I can now sneeze without going into back spasm. I can more easily climb stairs. I can sit for longer periods of time without it triggering spasms. I would highly recommend this belt to anyone. The only reason why I gave it a 4 star instead of a 5 is because I wish the belt were wider. Due to years of inactivity, I am carrying some weight in my mid section. The belt does fit despite my girth, but occasionally cuts into my flesh. I wish it could be a little wider which I think would help the discomfort from that. Despite this minor discomfort, I think the belt is fabulous and I will not go without wearing it daily. I received the belt very promptly and the quality of the belt material and manufacture is exceptional. Thank you Dr. Serola! I luv this belt. My lower back just feels secure and stable. Thank you! I'm 69 years old. I had tried a friend's belt during a Zumba Gold class. My immediate response was "oh wow, does that feel good." I had been feeling pain discomfort periodically during the day ... felt like a sharp twinge and especially following a dance or an exercise class, as well as getting up from the couch. No more twinges! I luv, luv this belt! I received my belt promptly. I'm a teacher and am on my feet all day. Belt provides stability and support. I have lower back pain and the belt helps. Even wear it when I'm gardening and doing work around my house. I have had pain since 2008. My physical therapy in 2008 was so bad that I never wanted to go back for it didn't help and made it worse. My SI Joint pain was so bad it made me walk to compensate and messed up the muscle on my other hip, so my orthopedic doctor sent me to physical therapy again. My new physical therapy is the absolute best. After repeated attempts to get my SI Joint to stay put they recommended your belt. LOVE LOVE IT! I am finally getting pain relief. THANK YOU! I have told several other people about it. Worked great to help with my si joint pain during pregnancy. I wore it constantly during the day and was able to continue working with this on. I have worn a Serola Sacroiliac Belt for several years. I recently bought the newest version and this is the best by far. I wore the new one while running a marathon and couldn't even tell it was on even though I placed it on bare skin. This couldn't be more comfortable. I write and publish "Senior Golfer" Our.mission is to help raise awareness of products that help Senior Golfers be the best they can be playing golf. The Serola Sacroiliac Belt is a great to benefit Seniors. Like most products I write about I use the Serola Belt. I have a 5th jammed lumbar the pain would get so bad during a round of golf the only thing that would give me relief is medication like Hydrocodine. During a round I would have to take at least t two. Now that I wear the belt and I have not had to use any pain medication when playing golf. Today I played 18 holes, without the belt, after only 4 holes the pain started and only got worst during the 18. I strongly recommend the belt to my fellow Seniors. I love this support belt. It provides great support and comfort. I also like that it is easy to 'hide' underneath a shirt; it's not too bulky. It helps my back much more than the "traditional" back supports that are much wider. It helps me in particular when I have to stand for long periods of time. I would recommend this belt to anyone with back problems. This belt was recommended by my Ortho-Spine MD. Great support, helps w/ the discomfort. The only thing I'd add to the belt is a Sacral plate or pad; something to give direct pressure support and for positioning the belt. This is my 2nd (or backup). I love it and it works especially good for golf. allows me to continue to play without bulky and HOT back braces especially in the hot Georgia summer time. My husband was turned onto your belt some 15 yrs ago by a physical therapist, and it saved his SI joint. Since then I use it every time I lift, shovel, dig, etc and have told many men & women who do physical work about it's amazing support. Recently I needed to purchase a second one (due to my growing size :) and found the quality & effectiveness just as good as the original. Helped a lot with lower back pain!! Is this a good product I would give it five stars. I have degenerative lower back disc disease. The serola belt has inabled me to get through a whole round of golf without pain. Helps keep the pain away. Good investment. I love my belt, I'm ordering a second one to keep at home. I'm a wound care nurse and it really keeps my pelvis stable and aligned while I'm performing my job. I also put it on if my low back or upper legs are feeling tweaked and it immediately provides comfort and stability and allows everything to readjust into place.